Our history of Seattle’s waterfront continues with Part Four. Subjects include pioneer settlement, the first “discoverers,” names – native and European – and maps. Another event, although scarcely remembered, is an important marker to this “Seattle Comedy”– when we end the happy story in 1911 with the opening of the “Harriman Depot.” It has more to do with steam than with sail. That year the Federal Treasury Department transferred the Puget Sound Port of Entry to Seattle, leaving Port Townsend a sub-port. As recently as 1889 a New York newspaper described Port Townsend as ranking “only second to New York in the number of marine craft reported and cleared, in the whole U.S.” The same Panic of 1893 that exposed Tacoma’s economy as too narrowly built around railroads deflated Port Townsend. Its boom time population of 7,000 crashed to 2,000 and its harbor filled with idle ships. More importantly the maritime winds were changing because wind – except the ferocious kind – was becoming irrelevant. By 1911 Port Townsend’s positioning as the “Key City” to Puget Sound was no longer of any advantage. Steamships had practically replaced the brigs and barkentines. In 1854, when Isaac Ebey first moved the Territory’s federal customs collection from Olympia to Port Townsend, he was deaf to the complains of the territorial capitol’s residents because he knew that sailing ships had a good chance of making it on their own down the Straits of Juan De Fuca as far as Port Townsend. After that they often needed either patience or the help of a tug. Steel-hulled ocean-going steamships did not need the breeze and preferred joining their customs work while unloading and/or loading their cargos and that was most likely to happen in Seattle. And here we have the moral of this comedy. All along – even during the setbacks of its struggles with Tacoma and the Northern Pacific Railroad – Seattle’s early development as Puget Sound’s primary port and thereby much more than a company town made it ultimately the metropolis. With this cosmopolitan knack Seattle – and as we will see below, for a time also its City Council – married the Great Northern. There is no record of what the U.S. Navy Lieu. 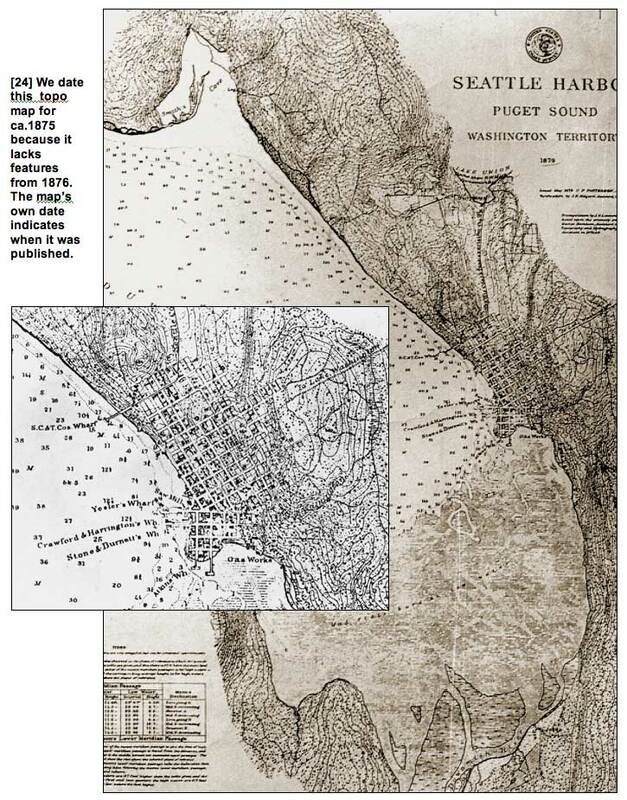 Charles Wilkes thought of the metropolitan potential of Elliot bay when in the course of exploring Puget Sound and naming many of its features he – or his cartographer – made the first map of the shoreline between Alki Point and West Point. (West Point is Wilkes’ name but his Pt. Roberts was ten years later revised by locals to Alki.) For the future central business district the Wilkes’ map features a beach stylized as a series of protruding bluffs. But the main features of the central waterfront can be deciphered, like the turn at Union Street and the bump at Broad. Most obviously there is the small peninsula that Wilkes named Piners Point after Thomas Piner a quartermaster on the expedition. This rendering of Piners Point is the first map-name given to the historic center of Seattle, what is now the Pioneer Square Historic District. Piners Point extended from a low point somewhere between Yesler and Washington Streets (probably closer to Washington, although descriptions vary) almost as far as King Street. The native name for it was Djidjila’letch, which translates “little crossing over place.” This may refer to the isthmus – the “low point” just noted – that connected the relatively flat peninsula to the south from the hill side to the north that later became Seattle’s Central Business District. On the occasion of high tides or storms this low connector would flood and turn Piners Point into an Island. One short-lived pioneer name for this neighborhood south of Yesler Way was Denny’s Island but it was really Doc Maynard who is most associated with it. The point was part of his claim and he sold property there at prices meant to encourage development. The name Djidjila’leetch may, however, refer to the fact that the village was at the Elliott Bay trailhead for “crossing over” to Lake Washington. The trail took much the same route graded later as Yesler Way and beginning in 1888 rumbled over by its cable cars. The expedition sketch of Piners point is perhaps too small to include what was very probably native structures that stood above the low bluff on the Point’s west side. To the east the point sloped into a salt marsh that also shows in the 1841 sketch. Crowding against the low bluff on the beach and closer to Washington Street than to King temporary sweat lodges were probably built. 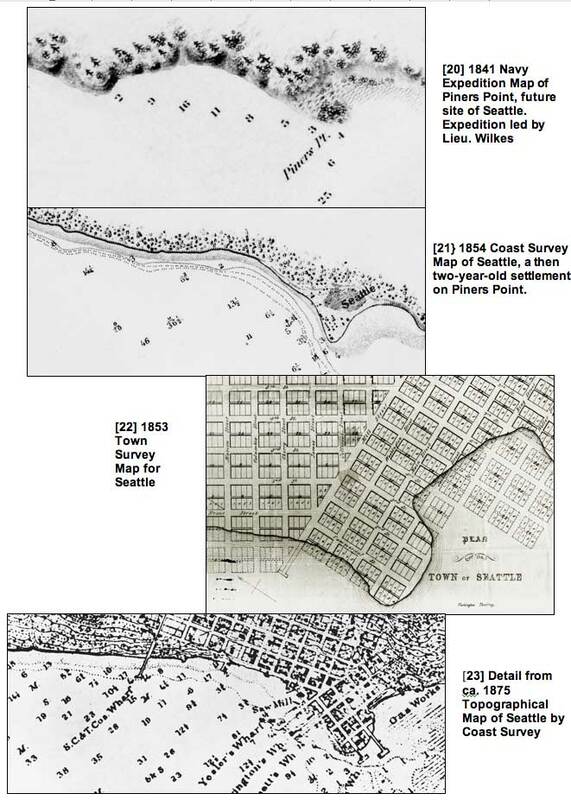 The Coast Survey made the next map of Elliott Bay – its shoreline and hydrography – in 1854. Seattle was then two years old and for an appropriate name Wilkes quartermaster Piner has been dropped for the Chief. Mostly likely after Wilkes sailed away no one ever referred to the point again as Piners except perhaps Piner himself. 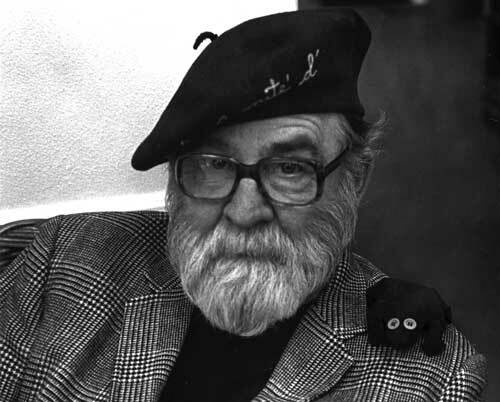 (Although Piner will still be remembered by Point Piner on Vashon Island, also named for him.) It is unlikely that the first settlers who came over from Alki Point in 1852 knew they were landing at Piners Point. They first proposed to call their fledgling community Duwamps (which was something like the pronunciation of the name for the local indigenes). One who stoon joined them, Doc. Maynard, persuaded the others, the Denny, Boren and Bell families, to trade the name of the tribe for that of its headman. Since it was never easy for Euro-Americans to wrap their embouchure around Lushootseed pronunciations (similar in difficulty to learning French as an adult) early on Seattle received a variety of spellings and pronunciations, and there is still an earnest but perhaps too sincere minority that thinks the city’s name should be changed to Sealth. A comparison of the soundings in the 1841 and 1854 maps shows similar depths and we may imagine that Bell and Denny would have liked to have had Wilkes’ map in hand when they explored this shore in the winter of 1852, taking their own readings with a weighted clothesline. They found, we know, relatively deep water close to shore that at high tide would allow boats with even the lesser ocean-going draughts to bump up close to a short dock or a removable off-shore gangplank or float and do their business without having to first transfer every item to a smaller vessel. The deepest soundings were between the future Union and Lenora Streets – as we might expect below Denny Hill. As noted above this is part of the waterfront along which the Port of Seattle, following the Second World War, proposed to build long parallel docks to handle the bigger ships because the water was too deep near to shore to construct longer finger piers than the ones then already in place. 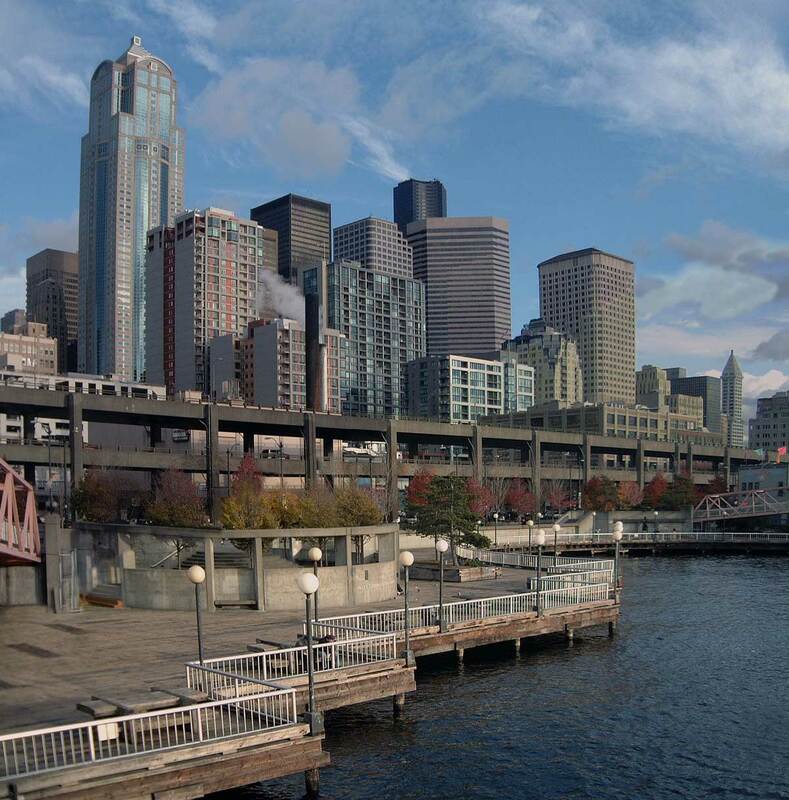 The position of Yesler’s wharf was a compromise between the deep and the shallow. With his mill operation, Yesler was also able to extend and protect his wharf with his own manufactured waste. The sand spit that appears in the 1854 map is still in place two years later, and the salt marsh too, for Yesler’s waste has not yet reclaimed it. Given Phelps’ greater detail most likely it is he who has refined the shape of Piners Point – if not the location of the blockhouse. The 1856 map has regularized, beside a few marked streets, the informal dapple of buildings that the Coast Survey of 1854 roughly features as the fledgling village. In the accompanying printing of the map, the dotted lines of the eventual Seattle grid have been superimposed over it. The streets as drawn are at least close to being properly set. Lines have also been introduced that show the limits of the original pioneer claims. The claims are named (except for Maynard’s on the south) and are also distinguished by shadings of different contrast. The offshore yellow (added by this author) marks the new section of waterfront that was reclaimed behind seawalls in the 20th Century. The First Methodist Church at the southeast corner of Second Avenue and Columbia Street appears on the far left of the sketch although it is not lettered in the map. One ready cross-reference between the map and the sketch is the Felker House, although Phelps has given it the knick name of its proprietress Madame Damnable. 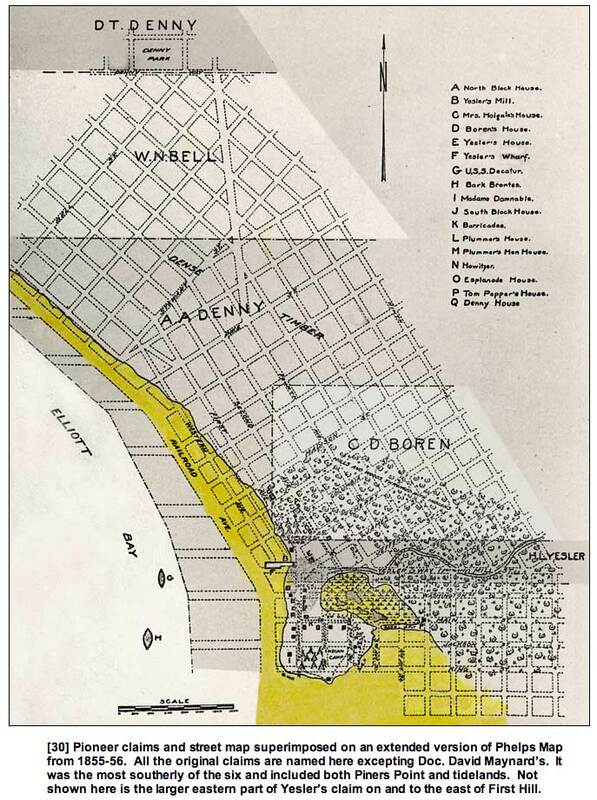 In the map it is lettered “I” and appears at the far southwest corner (lower left) of the peninsula facing Jackson Street midway between Commercial Street (First Avenue S.) and the low bluff that falls to the waterfront. In the sketch Madame Damnable’s hotel – the first substantial structure in town that was built of finished lumber – is far right with its back to the end of the point at King Street. The Felker house was destroyed in the 1889 fire, and consequently can be located in many of the views of the city recorded from the King Street Coal Wharf after its construction in the late 1870s. One of the community’s earliest (and yet undated) extant photographs looks directly across Jackson Street at the hotel. One may imagine a man remembered only by the name of Wilson watching the Battle of Seattle from the hotel’s verandah long enough to be hit and killed by a bullet fired from the forest. Wilson was one of the only two mortal casualties inflicted on the settlers during the battle. The other was also an imprudent spectator who looked out from the temporarily opened door of the blockhouse. Whilte not counted the number of casualties suffered by the natives was certainly much greater. In the map by Phelps the phrase “Hills and Woods Thronged With Indians” is written a little ways below the name D.C. Boren. The map also shows an “Indian Camp” at the southern end of Piners Point and directly east of Damnable’s. This including the Felker House footprint is a traditional native site, although Phelps’ “tee-pees” were not the style of construction used by Indians on the Northwest Coast. 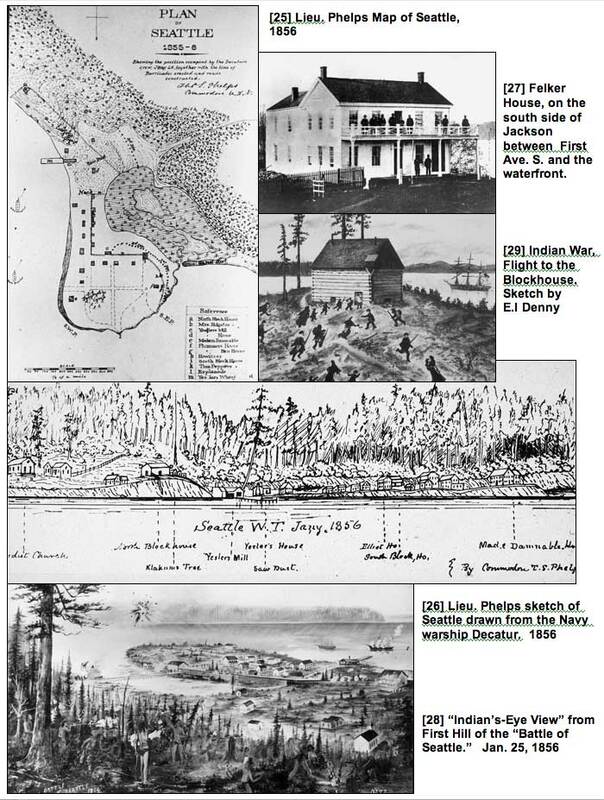 As noted earlier, located both near the trail to Lake Washington and the Duwamish estuary the native “winter camp” on Piners Point was one of the largest villages of the Duwamish. Tribal informants indicated that at one time Djidjila’letch (or Jijilalec) included eight large longhouses and at about the time that the English Captain George Vancouver sailed into Puget Sound in 1792 may have been home for as many as two hundred members of the tribe. When Denny, Bell and Boren explored the site early in 1852 its was deserted and they stumbled upon the remains of only one longhouse. This is puzzling because only two years previous the pioneer Isaac Ebey visited the future Seattle site and was given a rare invitation into a longhouse there by Chief Seattle. Ebey witnessed the Indians’ celebration welcoming the Salmon’s return to the mouth of the river, where in appreciation the natives waited to snag them with tripod weirs built across the river. Robert Monroe, ca. 1978. Posed at the U.W. Northwest Collection. Robert Monroe, for many years the director of the University of Washington Northwest Collection, at least once received a request for photographs of the 1851 Denny Party landing at Alki Point. It is not so absurd to think that there might have been such, for photographic apparatus could have been packed by any of the setters. Seattle is younger than photography. When a few midwestern farmers first picked this place to settle down and farm and/or build a city, photography through the Daguerreotype process had already been with rapidly circulating worldwide for a dozen years. The earliest surviving photograph of San Francisco dates from 1850 and for Portland from 1853. Both are Daguerreotypes. Portland, of course, was base camp for all the first Seattle settlers in their exploration of Puget Sound. As already noted the earliest revealing photographs of the central waterfront in Seattle date from 1869 — two images that we will explore soon below. From these and other early photographs and recollections we can build a convincing description of the native land that David Denny, Lee Terry and John Low first looked across to from Duwamish head in September 1851. The Railroad tunnel beneath the city was completed in 1905. During excavation a prehistoric Seattle was uncovered that included an ancient streambed with water-worn pebbles, and cobblestones between Cherry and Marion Streets. Beside this stream, directly below the Rainier Club at 4th and Marion, the remains of a forest were uncovered. Distributed above this really underground Seattle is the blue clay, gravel and hardpan of the last Ice Age. These not so scintillating contributions have been exposed time and again with the cuts made during Seattle’s many regrades of the early 20th Century and later with its skyscraper pits. It is, of course, the forests on top of the ice age droppings more than the forest discovered beneath them that excite – the green cover nurtured through the millennia following the big thaw. 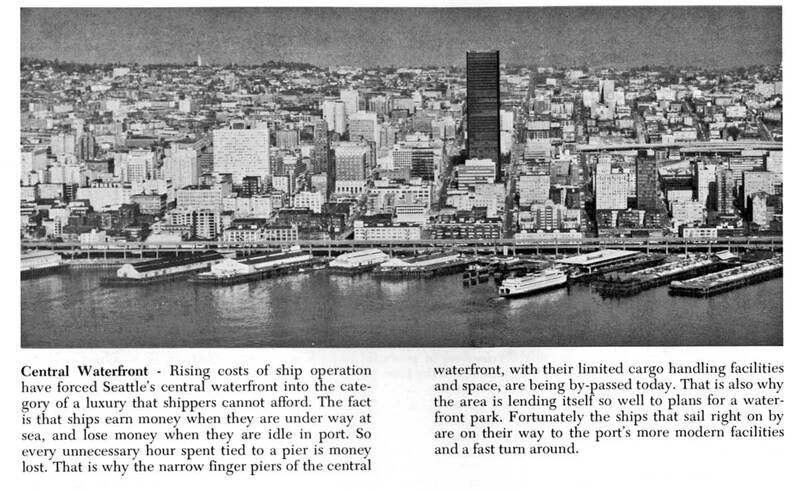 Port of Seattle centerfold shows aerial of city in 1971 and description of Seattle’s waterfront “options.” Click to Enlarge. Seattle skyline from Pike Pier, 2003.